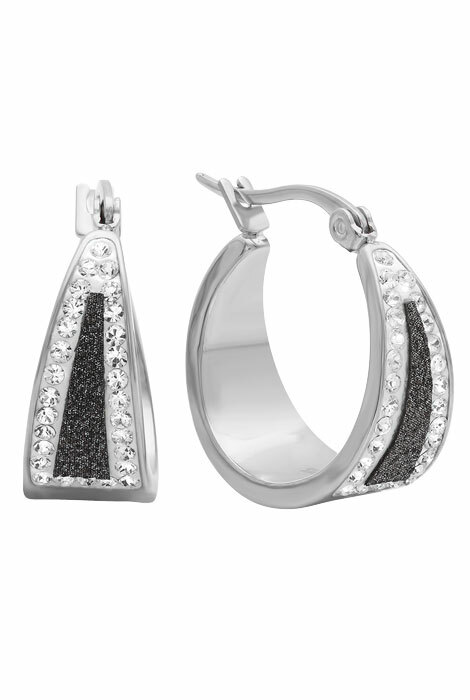 Fashionably contrasting black diamond dust hoop earrings feature black cubic zirconia surrounded by sparkling clear CZ stones. Made from stainless steel, a quality choice in jewelry design because of its beautifully polished finish, durability, and resistance to rust, oxidation and discoloration, even in humidity. Choose from silvertone or 18k gold-plated steel to complement any wardrobe. 3/4” dia. hoops with bar closure. Polish metal earrings with a soft, dry cloth. Allow 2–3 weeks for delivery. Can I get the Black Diamond Dust Hoop earrings earrings in gold color? BEST ANSWER: Thank you for your question. Unfortunately the gold is not available with our vendor. At this time we only can get the silver. We suggest to keep watch of the item as the gold may come available at a much later date. We apologize for any inconvenience.